The free, downloadable book published in partnership with the U.S. Green Building Council’s Center for Green Schools recognizes colleges that have demonstrated a strong commitment to the environment and to sustainability. Lawrence Tech has a Low Impact Development Trail that showcases the various stormwater management techniques put into proace around the campus. One of the highlights is the vegetated green roof that covers part of the A. Alfred Taubman Student Services Center. The 322 colleges were chosen for the guide based on the “Green Rating” scores The Princeton Review tallied for hundreds of colleges in 2012, including data from a 50-question survey of college administrators about their environmental and sustainability-related policies, practices and academic offerings. 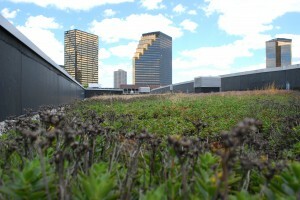 “Geothermal wells and a vegetated roof are just two of the impressive features of LTU’s A. Alfred Taubman Student Services Center, a unique green building that serves as a living laboratory for sustainability education of architects and engineers,” the guide reported. Those two features of the Taubman Student Center are on LTU’s Low Impact Development Trail that showcases the various stormwater management techniques put into practice around the campus to reduce the impact of development on the environment. Senior VP/Publisher Robert Franek noted that The Princeton Review’s 2013 “College Hopes & Worries Survey” showed that 62 percent of college applicants responded that having information about a college’s commitment to the environment would influence their decision to apply or attend. “We are truly pleased to recommend Lawrence Technological University along with all of the fine schools in this book to the many students seeking colleges that practice and promote environmentally responsible choices and practices,” Franek said. LTU’s inclusion in the prestigious national guide to “green” colleges confirms a long-term commitment to sustainability that has been demonstrated in many areas of the university’s operations and academic curricula, according to Joseph Veryser, LTU’s campus architect.